The Marquee Matchup of the week for Ontario University Athletics proved to be anything but -- with another blowout again on the horizon. The Wilfrid Laurier Golden Hawks hosted the Carleton Ravens in what was anticipated as one of the "more exciting" games of the week. Carleton was coming off a tremendous hail mary pass to win the Panda Bowl, and the Hawks were back from a bye week after obliterating the Waterloo Warriors, and were playing in front of around 7,500 fans. Coming into the game, expectations were that this game would be "close" -- people I talked to thought maybe a 14-point spread in favour of the Hawks, but nothing like what they saw on Saturday. Laurier walked away handedly with a 36-3 victory and moved into fourth in the OUA. "You're never quite sure coming off a bye week. We tried to keep our schedule as close to normal as we could, and our guys came out and played. Offence, defence, special teams all played really well," head coach Michael Faulds said. 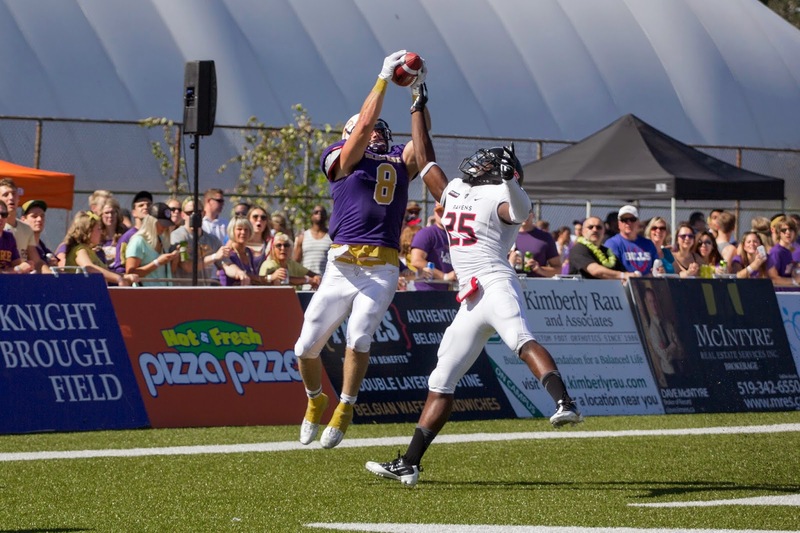 Laurier's team is improved -- they're one of the few teams that was a "have-not" last year (albeit also considered one of the "best 1-7 teams in recent history), but found a way to reformulate their team and turn into a contender. Their script has gone as expected -- defeat Toronto, Waterloo and Carleton and lose a close game against the Windsor Lancers, one of three teams left undefeated. But the big issue here is that the teams that Laurier played have a combined record of 7-11. Doesn't seem like that big of a spread, right? How about the teams that the top-seeded Western Mustangs played through the course of their first four games -- which have a combined record of 3-16. There's a distinct line within the OUA, with four teams sitting with a 1-4 record of worse, while five teams sit with a 3-1 record or better. The issue isn't even just with the OUA. Look at Quebec, where the Laval Rouge et Or make the RSEQ look like the easiest route back to the Vanier Cup with a recent 70-3 victory over the McGill football team. In Week 4/5 (depending on the conference), the closest game was a 42-41 victory for the Calgary Dinos over the Manitoba Bisons Friday night. The spread for every other game (winner/loser, not including the Calgary/Manitoba game)? Let me pull out my calculator. "Those four wins made as an emphatic statement on the weakness of Canadian university football as one can make. There are far more have-nots than haves and except in exceptional years, the haves continue to have while the have-nots are embarrassed. How to fix the weekly beating the have-nots are forced to suffer is something that won't be easy to figure out, but in some fashion a solution needs to be found or the popularity of university football, and on some campuses its very existence, will remain on a razor's edge." So, how do we fix this? The lack of parity has always existed in university football, but the issue has become more and more prominent in recent years. There are those exceptional teams that make every other game interesting, but you're lucky if you get two games that keep your eyes glued to the screen. Those have-nots are without for years and have no way to rebuild their programs while the haves run the score up; some coaches even use it as an extra practice before playing the "harder" teams. This is the reason that major sports broadcasting stations don't take a second look at the regular season games. If the conferences can't guarantee competitive games, and most of the time will martyr their weaker opponents in lieu of their more promising candidates for the national title, how do you expect viewers nationally to be intrigued? Laurier pulled Dillon Campbell out of the game 2.5 quarters in on Saturday. Even including the Windsor game, Campbell hasn't played a full four quarters and still leads the country in rushing yards and touchdowns. He has more rushing yards on his own than the entire York Lions team. Laval's journey back to the ever-desired Vanier Cup becomes infinitely easier the more parity becomes a common practice in the CIS. With a sanction just laid on the Calgary Dinos, there could be some interesting weeks ahead. But it's taken an ineligible player to make things intriguing in CanWest. What's it going to take to make the entire country interesting? parity: the state or condition of being equal, especially regarding status or pay. You might want to reword your 2nd and 6th-last paragraphs.